Trei Oliver will be a first time head coach at NCCU but he’ll have a veteran staff of assistants to help shape the program. 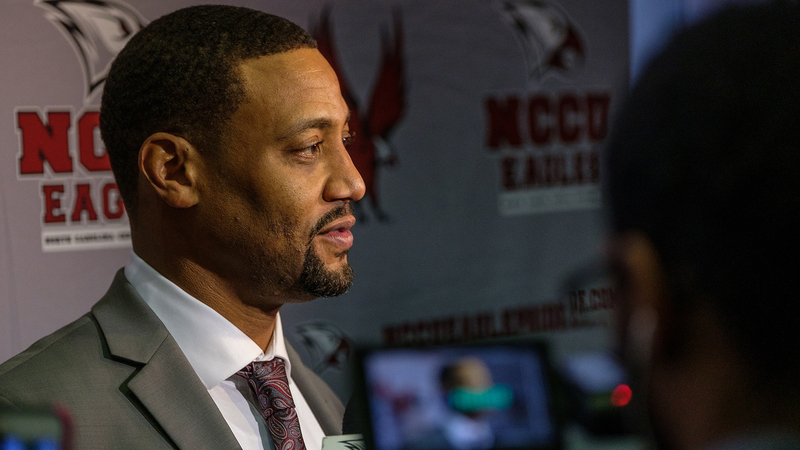 DURHAM, N.C. – North Carolina Central University’s new head football coach Trei Oliver announced five members of his coaching staff on Monday (Jan. 14), which includes an NCCU alumnus, three HBCU graduates and various experiences in high school, college and the National Football League. Oliver was announced as NCCU’s 24th head football coach on Dec. 13, 2018. The news of his hiring was first reported on HBCU Gameday. He has named Moses Ware, one of NCCU’s all-time leading receivers, as offensive coordinator and wide receivers coach, Juan Navarro as recruiting coordinator and defensive line coach, Brian Jenkins as special teams coordinator and running backs coach, John Tomlinson as quarterbacks coach, and Lonnie Teasley as offensive line coach. Oliver will announce the rest of his coaching staff at a later date. Ware spent eight seasons (2011-18) at Bowie State University, including the last five campaigns as offensive coordinator/quarterbacks coach and three years as tight ends coach. In the past four seasons, the Bulldogs advanced to the Central Intercollegiate Athletic Association (CIAA) championship game (2018, 2016, 2015) and the NCAA Division II playoffs (2018, 2017, 2015) three times, winning the CIAA championship and a first-round NCAA playoff game in 2018. Under Ware’s leadership, Bowie State topped the CIAA in passing offense and first downs for four consecutive seasons from 2015-18. In 2017, the Bulldogs ranked No. 1 in the NCAA Division II in scoring (54.5 points per game) and total offense (566.3 total yards per game). Prior to Bowie State, Ware was head coach at his alma mater, F.W. Ballou High School. During his five-year tenure (2006-10), the Knights posted a 37-17 record and captured the first D.C. Interscholastic Athletic Association championship in school history in 2006. He was selected as the 2010 Washington, D.C. Pigskin Coach of the Year. Ware started his coaching career as a wide receivers coach at NCCU, and worked three seasons (2003-05) as offensive coordinator at Calvin Coolidge Senior High School. As a player, Ware ended his NCCU career (1991-94) as the fourth-leading receiver in school history with 132 catches for 1,822 yards and 15 touchdowns. He signed as an undrafted free agent with the NFL’s Tampa Bay Buccaneers and spent two seasons with the Minnesota Vikings. Ware earned his bachelor’s degree in criminal justice from NCCU. Navarro spent the past three seasons coaching in the Southwestern Athletic Conference (SWAC) as defensive coordinator/linebackers coach at the University of Arkansas at Pine Bluff (2018) and defensive line coach/director of football operations at Southern University (2016-17). In 2015, he was defensive line coach at the University of Redlands (Calif.), where he earned both his bachelor’s (2002) and master’s (2004) degrees and started his coaching career working with linebackers and defensive line from 2001-05. Navarro served as head football coach, defensive coordinator and defensive backs coach at Los Angeles Valley College for the 2014 season, and was defensive coordinator/defensive backs coach/associate head coach at Los Angeles Pierce College in 2013. He spent six seasons (2007-12) with Florida International University, holding a variety of positions from director of football operations to assistant coach in charge of defensive line and linebackers, and was an offensive assistant working with the offensive line at the University of Miami in 2006. Jenkins brings 25 years of coaching experience to NCCU, primarily at NCAA Division I universities, including eight seasons as a head coach. He burst onto the MEAC scene as head coach at Bethune-Cookman University in 2010. In five seasons at B-CU, the Wildcats captured four conference championships, made three trips to the FCS playoffs and claimed two HBCU national titles. He left B-CU to lead Alabama State University’s football program as head coach for three years, then worked as special teams coordinator/running backs coach at Alabama A&M University last season. Jenkins started his coaching career in 1994 at Western Kentucky University as passing game coordinator/wide receivers coach and held assistant coach positions at Eastern Illinois University and Bowling Green State University before joining NFL Europe as special teams coordinator/running backs coach with the Frankfurt (Germany) Galaxy in 2001. He then spent seven seasons (2002-08) in the same capacity at the University of Louisiana at Lafayette, before moving to Rutgers University as wide receivers coach for the 2009 campaign. Jenkins played four seasons as a wide receiver, running back and return specialist at the University of Cincinnati, graduating with a bachelor’s degree in social work in 1993. Tomlinson has more than 20 years of coaching experience from high school, college and the NFL. In 2018, he was the offensive coordinator/quarterbacks coach at Forney (Texas) High School, guiding the top quarterback and running back in the district, while also serving as an offensive consultant at Piscataway (N.J.) High School. Tomlinson spent the 2017 campaign with the NFL’s Cleveland Browns as assistant quarterbacks coach/offensive quality control coach. He worked four seasons (2013-16) and celebrated two state championships as quarterbacks coach/assistant passing game coordinator at Cedar Hill (Texas) High School. Tomlinson worked in the MEAC as quarterbacks coach at Morgan State University in 2012. The first 12 years of his coaching career (1997-2008) were served at a variety of high schools in Virginia and North Carolina, including Hillside High School in Durham, before obtaining his first college job as running backs coach at Southwestern Assemblies of God University in Texas. Tomlinson is a 1993 graduate of Winston-Salem State University. Teasley spent the past two seasons as the offensive line coach at the University of Arkansas at Pine Bluff (2018) and Tennessee Tech University (2017). He worked in the NFL for two seasons (2015-16) with the Baltimore Ravens, assisting the offensive line coach, and was assistant offensive line coach at Temple University for the 2014 campaign. Teasley coached for three years in the MEAC as an assistant coach and graduate assistant at Delaware State University, leading the linebackers (2013) and tight ends (2011-12). He started his coaching career at Brunswick (Georgia) High School as defensive line coach for three seasons (2008-10). Teasley played as an offensive lineman at Hofstra University and Winston-Salem State University, graduating from WSSU in 2008.